Elsabe Dixon is an artist and educator whose practice includes drawing, construction, curating, installation, writing, performance and social engagement. Dixon received her BA from Averett University with a minor in History. In 2011 she received her MFA from George Mason University in New Media, and now teaches Sculpture and Foundation courses at the School of Art – George Mason University. Dixon also works for the Glenstone Museum. South African born and Virginia-based, Dixon uses biological life cycles of insects to investigate and rationalize her relationship with changing systems and network interfaces through audience interaction. She explores the concept of sensory memory and visceral reaction through her work. Dixon has shown at the A.I.R. 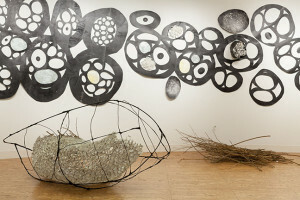 and 440 Galleries, Brooklyn NYC; the Borowsky and Nexus Galleries, Philadelphia; and the Society for Contemporary Craft in Pittsburg, PA. She is currently completing a residency at Artisphere in Rosslyn, VA. She has been a grant recipient for Lumen8 in Anacostia (2013) and the Chenven Foundation (2011). I am a conceptual artist working primarily with live organisms, in particular Bombyx Mori. My practice focuses on live insects and interactive environments, which explore biological and technical as well as social systems. I approach the studio environment as a test laboratory; creating work that considers the viewer as an intrinsic component of the work, but which also acts as a platform for engagement between the audience, the community and the cultural history of materials as well as processes. Most of these live-insect environments are constructed with repurposed materials. I explore alternative strategies of object making, using both analog systems, the empirical and organic collaboration. My process is research that not only investigates the mediating effect organic environments have on our sensory perception of space and objects through which the body moves, but also allows chance operations, mimetic systems and audience participation.